Mt. Ararat junior Lisandro Berry-Gaviria ran to a 46th place finish in the Nike Cross County Nationals on Saturday in Portland, Oregon on the Gleendoveer golf course. Berry-Gaviria the two time Class A cross-country state champion was competing in his his national meet, becoming the first Maine high school athlete to qualify for the NXN in the 15 year history of the event. Lisandro arrived in Portland on Thursday, and dealt with some nausea and wasn't feeling very good at all. He got a strong 12 hours of sleep that night and was feeling much better come Friday. Coming into the meet he was hoping for a top 50 finish but knew it wasn't going to be easy. After opening with a 4:53.8 for the first mile, Berry-Gaviria found himself in some uncommon territory in 92nd place. He was just six seconds back of the top 50 so nothing to panic about. 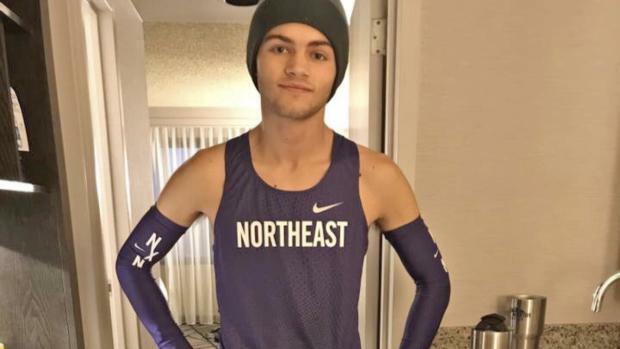 As he did the previous week in the NXR at Bowdoin Park, he surged during the second mile moving up through the field to 54th after a 5:09.7 clocking. He continued that forward movement over the last mile picking up eight more spots with his 5:39.2 over the last 1.1 miles. "Pretty happy with it" Berry-Gaviria told us via social media on Saturday evening. The performance certainly will make his name a little more noticeable in the national recruiting scene. He is the sixteenth fastest underclassmen in the field. Qualifying for the national meet has his stock rising in the all-time best Maine cross-country runners i\with a year to go to add to his already impressive resume he is moving up the list fast.